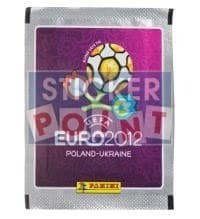 The 14th European Football Championship 2012 took place in two countries, namely in Poland and the Ukraine. This EURO is currently also the last in which 16 teams have participated. As of 2016, 24 teams will compete in the final competition. 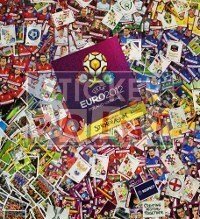 This could also mean that the Panini sticker albums will contain more pages and that more images can be stuck in. 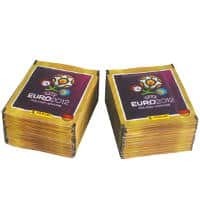 As a result, this Panini EURO 2012 sticker collection is, in a certain manner, a true particularity. Besides, this European Football Championship was also a premiere since it was the first EURO that took place in Eastern European countries. The two host countries Poland and Ukraine made a great effort to leave a lasting impression on their guests and spectators. True to the motto: "Let's write history together" the two countries succeeded in filling Europe and the world with enthusiasm. 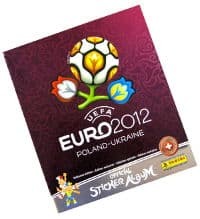 Let yourself be fascinated by this historic event when collecting the complete Panini Sticker album 2012. 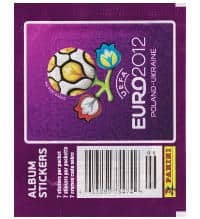 The collector's album Panini 2012 is the first album in the color purple. 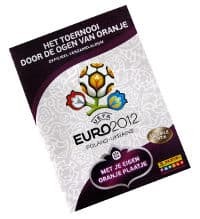 On the cover, there is the logo of the EURO 2012 that presents a flower. The flower has two calyxes that are colored in the national colors of the host countries Poland und Ukraine. 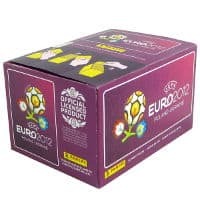 In addition to that, the blooming ball presents the emblem for the football EURO 2012. The flower symbolizes the beauty and the fairness of the football matches. 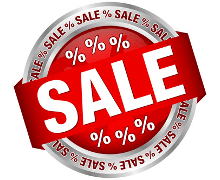 The logo is in the natural colors that shall express the play of color of this EURO. The color green stands for the forest, yellow for the sun, blue for the water and raspberry red should represent the passion that was stirred during this EURO. Panini has also been inspired by these colors and therefore picked them up when creating the album. 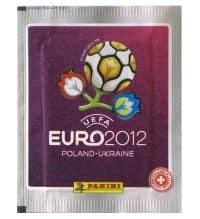 For this reason, the Panini EURO 2012 album looks very vibrant and colorful. The 64 pages of the album are designed in a likewise manner and are just as vivid and fascinating as the EURO 2012 has been itself. 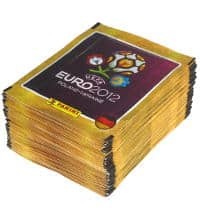 In total 540 images can be stuck into the Panini EURO 2012 sticker album. 40 of these stickers are the highly demanded silver glitter images. For each team, there are 20 images plus 2 glitter images, the club emblem and the mascot. 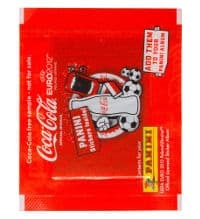 Every Panini packet contains 5 images. The packets are color matched to the collector's album. They only have different colors for each nation and the edges are also colored differently. 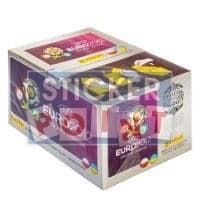 In the German album, there is a poster on which D1-D20 special stickers can be stuck on. These exclusively exist in the German packets. The poster is only available in the German edition of the album. 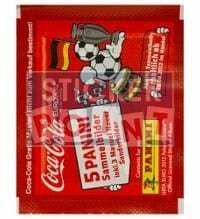 Besides there were 6 stickers of Manuel Neuer that could only be put into the German album; the Manuel Neuer heroic deed of Coca Cola. These images couldn't be bought but were the free supplement with the purchase of a crate of Coca Cola. 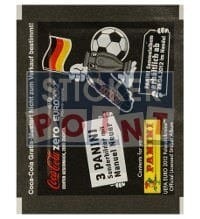 Another specific feature were the German stickers as a whole. 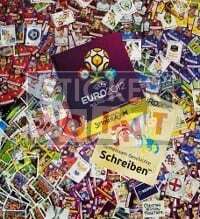 The sticker images have a purple edge, whereas the intro, the players in action and the images of the teams of the previous EURO winners, have a white edge. 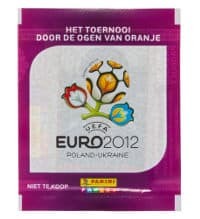 With the international Panini edition, the color of the edges was the exact opposite. 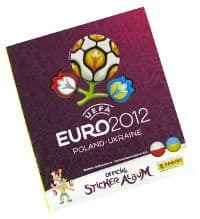 In the Polish and Ukrainian version, there are also special stickers. 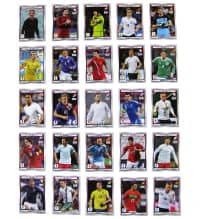 The images P1 to P20 show Ukrainian and Polish football stars. 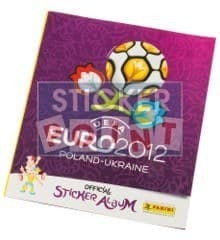 On the last page of the international version there is also a spot for special stickers. They are marked by the letter A-F and show international football stars. For the first time in the history of the company there also was a Panini Hardcover album. The international and German edition also were produced as a hard cover but only were available in a very limited number of pieces. 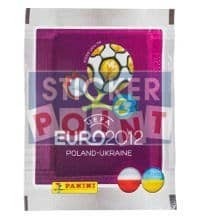 We invite you to experience the uniqueness and specialty of the Panini EURO 2012 sticker collection. In our shop, you can also find some of the very rare hardcover albums. Furthermore, we provide you with an accurate overview of the national as well as the international special stickers. Let yourself be fascinated by this passion of collecting.